Last week I promised some recipes from the Vegetarian Mother's Cookbook that I'm experimenting with and today I'm going to deliver. I've had a lot of fun experimenting with some of the recipes in this book the last two weeks. I should tell you that I am not strictly vegetarian, but have been reducing the amount of meat I eat for health reasons. This book provides wonderful balanced meatless meals whether you are vegetarian, looking for new ideas for Meat Free Mondays, or like me just trying to replace some of your meals with meatless alternatives. Here is one of entree dishes that I've tried and enjoyed. To make your own beans, start the night before by soaking a cup of beans in water overnight. When ready to cook the beans, throw out any floating beans and then rinse the beans well. To cook on the stove-top, add the soaked beans to 3 cups of water and cook for 1 1/2 to 2 hours. Beans can be cooked in a slow-cooker as well. For pre-soaked beans, cook in a slow cooker on high for 3-5 hours or on low for 8 to 12 hours. 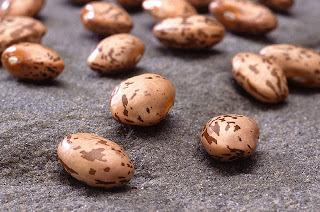 Extra beans can be frozen and then used later to add to soups, stews, casseroles, salads, or burritos. Preheat oven to 350 degrees. Oil an 8 inch square baking pan. Heat oil in medium-size pan. Stir in onion and saute about 5 minutes. Add garlic, chili powder, and cumin. Saute 5 minutes more. Add beans, tomatoes, and corn. Season to taste with sea salt and black pepper. Let mixture simmer uncovered while you prepare crust. Whisk together cornmeal and water in medium-size pan. Cook over medium heat until thickened (about 10 minutes). Spread 2/3 of the mixture over bottom and up the sides of the prepared baking pan. Pour bean mixture into crust. Top with remaining cornmeal mixture. (Don't worry if beans are not covered completely.) Sprinkle with shredded cheese if desired. Bake 30 minutes. Let sit 10 minutes before cutting. Make a couple of these and freeze unbaked for a quick meal on a busy night. To reheat, thaw pie in refrigerator then cover and bake at 350 degrees for 30 minutes. Remove cover and bake 15 more minutes, or until heated through. Quick nutrition fact: The combination of corn and beans in this recipe creates a complete protein much like what you see in animal meats.